Informing guests about your upcoming wedding can be intimidating, but it doesn't have to be hard. While there are numerous types of wedding announcements and invitations, only a few of these items are absolutely necessary to mail out before your big day. And not only does each piece of bridal correspondence inform friends and family members about the details of your wedding, but they also give guests a little taste of what to expect. Today we will focus on the wedding invitations. Whether you plan on getting married on a tropical island or in a small town with your closest friends, you should send out formal wedding invitations at least two months before you say "I do." Since they are the centerpiece of your wedding stationery suite, every single detail about your invites should match the theme of your ceremony. That's why when you order wedding invitations from Wedding Paper Divas, they review everything from the color to the font style and even the wording to ensure that they set the right tone for your celebration. 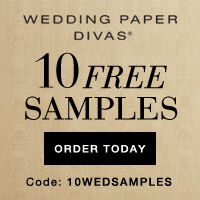 What's more, use code FREETRY for free samples at Wedding Paper Divas. Click on the button below and happy wedding planning! Whether you're looking for a card for your mom, your wife, grandmother, sisters, or in-laws, Treat has the card for you. Their cards are top-quality and you have 100% control of the content. 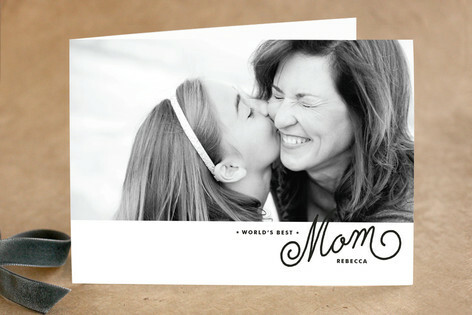 They have 450+ Mother's Day designs to choose from, ranging from funny to sentimental. You add your own pictures and text to make them uniquely your style. The best part is that right now you can get 25% off all Mother's Day orders by using the code TREATMOM25. 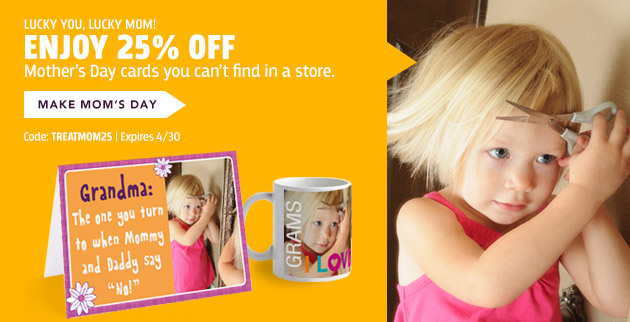 So visit Treat today and make sure to use promo code TREATMOM25 by 11:59pm PT on April 30, 2013 to save 25%. Getting hitched? See how you stack up with other couples. Mother's Day is right around the corner to celebrate all of our Mothers, Grandmothers, Mothers-in-law, Stepmothers, really Mothers in any form! What do you have planned for them? If you are looking for gifts for the Mother you'll be celebrating this year, look no further - Minted has the perfect gift ideas and is offering 10% off through April 22nd. Send your love and appreciation with an easy yet very personable Minted Mother's Day Greeting Card. Choose from a variety of designs from our outstanding community of designers, customize with a photo or special saying and it will come to you for you to hand write a personal note yourself! Minted Sweet Splash, is one of my favorites - but there are plenty others to browse through! Maybe you already have a card but are looking for a special gift for it to accompany? Personalized Journals and Stationery are a great way to show your appreciation for your Mother! Printed on a variety of luxurious, high quality paper stocks, Minted's stationary and customizable journals are cherished items and would make any Mother boast! You can even get her stationary to match her journal - see Golden Afternoon Journal and Golden Afternoon Personalized Stationary. If you're playing back all the times you listened to your Mother discuss the empty wall in her kitchen, Minted's Mother's Day Art is exactly where you should look! Surely to brighten your Mother's walls, Minted's spring themed art prints and spring wall art is created by our global community of independent artists and are printed in limited edition on museum-quality cotton rag archival paper with archival ink and are offered in a variety of sizes and colorways! What a fantastic way to show your Mother how unique and special she is to you?! Peonies in Vase is one of my favorites!